…a field trip where students think they’re in a different world; where fish can breathe air, birds can swim underwater, and cats can run faster than cars! JOIN US AT THE TORONTO ZOO FOR A DAY FULL OF EXCITEMENT, DISCOVERY, AND WONDER. 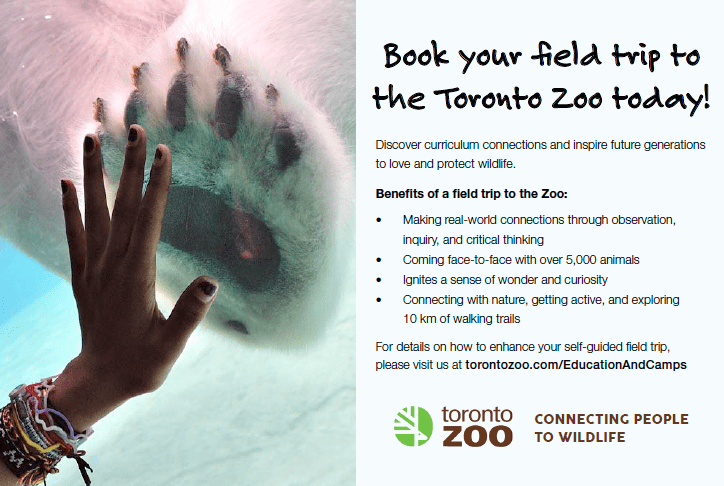 Engage your students in a variety of programs designed to bring curriculum to life, including grade-specific full- and half-day workshops, interactive polar bear programs, guided tours, Bush Camp (overnight experience), and Zoo School, or enjoy the flexibility of a self-guided tour and download FREE resources to support your visit! We’re confident you’ll have a WILD time!! Subject Areas: Programs are science and environmental based, but visits can incorporate art, math, geography, social studies, indigenous studies, and more!